Find respite from Los Angeles’ infamous traffic with a 30-minute airplane tour over some of the city’s most popular attractions and landscapes. 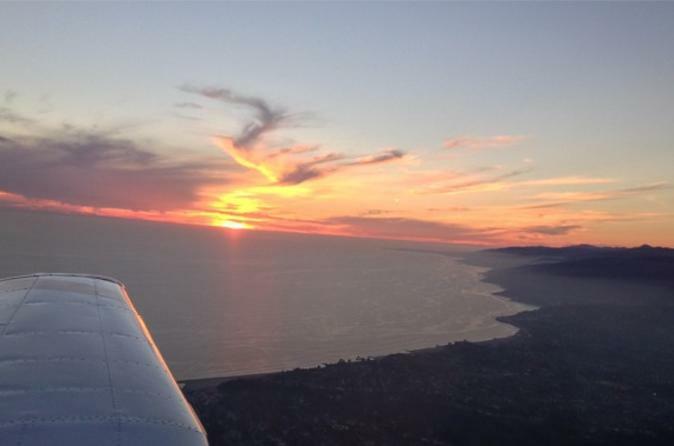 Enjoy an aerial sightseeing adventure over the Pacific Coast and Malibu Canyon. With a maximum of three passengers per plane, this narrated experience is an intimate and exclusive way to see the best of LA. Check in for your flightseeing tour at Van Nuys Airport, and relax with provided beverages and snacks before it’s time to take off in your 3-passenger airplane with narration provided by a professional pilot. The Malibu Canyon route offers incredible views of Los Angeles' gorgeous natural scenery. From the airport, head west along Highway 101 toward Malibu, flying over Westlake Village, San Fernando Valley, Conejo Valley, Calabasas, Lake Malibu and the Malibu Hills. Soar over and past the Pacific coastline, in awe of the ocean views, and then hold on as the wing of the plane dips down, turning around to bring you back over land. Admire Malibu Pier and Pepperdine University, and then continue along the coastline to Topanga Canyon. Turn left again over the hills to make your return flight to the airport, and enjoy views of Pacific Palisades, the Santa Monica Mountains and Encino Reservoir.